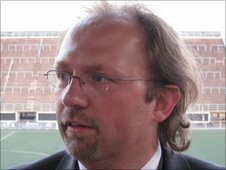 The proposed appointment of Belgian Tom Saintfiet as national coach has caused a huge storm in Zimbabwe. The media and vast majority of fans would like the acting coach Norman Mapeza to be given the job on a permanent basis. For their part, Zimbabwe Football Association (Zifa) officials are hopelessly divided over the matter. A press conference to unveil Saintfiet as the new Warriors boss was abruptly cancelled last Saturday. Saintfiet, who is midway through a four-year contract with the Namibia national team, is currently in Harare. But on Wednesday Zifa chief executive Jonathan Mashingaidze told BBC Sport: "There's still no news, there won't be an announcement today." A Zifa technical committee recommended that Saintfiet be employed although Zimbabwe would have to buy out his contract with the Namibia FA. But against a background of severe financial problems, Zifa chairman Cuthbert Dube took a different line. He stated categorically that Zimbabwe would not replace former Warriors captain Mapeza with the Belgian coach. Mapeza earned the respect of Warriors fans by getting Zimbabwe off to a good start in the qualifiers for the 2012 Africa Cup of Nations, with a 1-1 draw away to Liberia. Saintfiet's arrival has re-ignited the argument over the merits of a foreign coach, especially as Zimbabwe's two appearances at the Nations Cup finals have come under the guidance of local coaches.